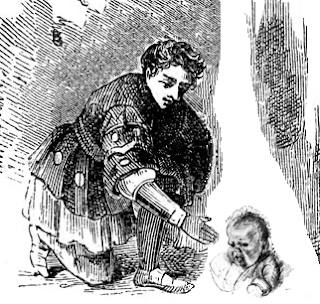 When encountered, the bantling will appear as a dirty, scraped up human infant. On seeing adventurers it will begin crying loudly. These shrieks are likely to bring wandering monsters. If picked up or given something to drink it will stop crying briefly. If given any kind of food it will fall into a peaceful slumber for about an hour. After that time has passed it will wake again and begin wailing for more food. As the bantling sleeps it grows. On first encountering it it will barely be able to crawl, after a first feeding it will be able to toddle haltingly on it's own. Each meal and sleep cycle will add an apparent 2 years to the bantling's age. This bantling never speaks, just cries and eats. It will not attack and if threatened with harm will scutter off into the darkness to find safety. Hi, good questions. I was actually, with all these monsters, trying not to be too "crunchy" to leave some detail up to the DM. I plan to post about that soon, because it seems important for old school creations. But as far as the little bantling, hmm, maybe I skimped a little too much on detail. I imagine this creature sitting silently in some dark corner and only making noise when a party's noise and light become evident. It is a kind of parasite and has an animal cunning, so it will only stay around while the getting is good. I suppose in my campaign I might make it age into its "teens" or "twenties" and then try to slip away. I had also imagined it would de-age as it went without food, so that after being driven from a party, or fleeing, it would eventually become the little infant in the darkness. The whole idea I was going for was that first tense situation, where adventurers see the baby and think "what do we do with this?" And then gradually realize something is not right. I'd never thought of gender, because it was never really human in my mind, like a fey changeling. If you want to make it weirder I suppose you could make it genderless, with no sexual organs at all. ah! i like the idea of it aging in reverse when it's not fed... maybe a lower level limit to it's age, like 4? enough to be annoying and a drag on the party but still a sympathy sponge? i like the role playing opportunities creatures like this afford. "I suppose in my campaign I might make it age into its "teens" or "twenties" and then try to slip away." So would that be the upper limit, or simply where it would run off? What does it get out of this? Would Bantling blood reverse aging? Also, if if it doesn't de-age, has an upper limit for accelerated growth, and gets more intelligent over time, then you could set up a moral dilemma for the players: Do they keep this thing that's now a human as a slave? Turn it into a hireling? Use it as a character? Release it into a city completely ignorant of the customs, laws, and even language of the area? Teach it what it needs to know? Fun questions, but I think you're crossing the border from the golden age to the silver age with them :) And I say that as someone who once admitted it would be fun to study how much blood stirges need to survive; in other words a very sympathetic party. The point is to provide an interesting situation, some dramatic tension. If adding some more details does that, that's fine. Maybe bantling blood is a spell component for a youth potion which could be a great hook for adventuring. But every detail you add becomes set, something difficult to take back and revise. Every detail reduces future possibilities. So basically, I would leave all these things up in the air-- the bantling is a type of fae, mysterious, soulless, inscrutable, closer to a crow than a human-- and if players are interested in pursuing details I'll make rulings as we go based on what would be most fun or interesting. Who Built The Fountain of Gender Exchange?